Modular ramps are built for both home and commercial access. 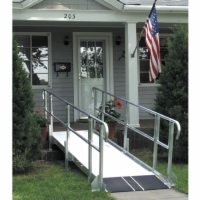 Our modular ramp systems are strong, durable, portable, flexible, and, best of all, affordable. We have extensive experience in helping our customers prepare for a permanent modular ramp installation. To begin planning for your ramp, please call our mobility specialists today at 1 (800) 790-5523, and we'll be glad to assist you in taking measurements and determining specifications.